I held a playtest day on Saturday, which included two tests of P2012-1, with changes since my previous test as well as a big change between the first and second tests of the day. In particular, Gil Hova made a suggestion which I (as he even predicted) despised the very thought of. However, he justified it with an argument too powerful to ignore. The game includes a positional control mechanic, as you can infer from the picture. One of the things players could do to break through an enemy's lines was to capture an enemy's piece or pieces and replace them with your own under certain conditions. This was a central aspect of the game as I had originally conceived it. This mechanics is pulled in combinations from Go, Othello, and Hex. Gil's objection was that to be on the receiving end of a capture, even if it required skill to execute, was a negative play experience. He didn't like the feeling of not only having an opponent advance, but to have himself be set back. He suggested that capture should be changed to allowing you to share a space with another player. My knee-jerk reaction was that sharing was anathema to a game about positional control. However, I realized that a non-trivial portion of the hobby game market is attracted to Eurogames for, among other reasons, their lack of take-that mechanics. I decided to give it a shot and we played with that rule in the second test. The change worked far better than I could have expected. Capturing switched from an offensive mechanic for devastating an opponent to a defensive mechanic that allowed you to escape tight spots. It was still extremely valuable to pursue as it could lead to big points, but no longer did the person on the receiving end feel bad as a result. 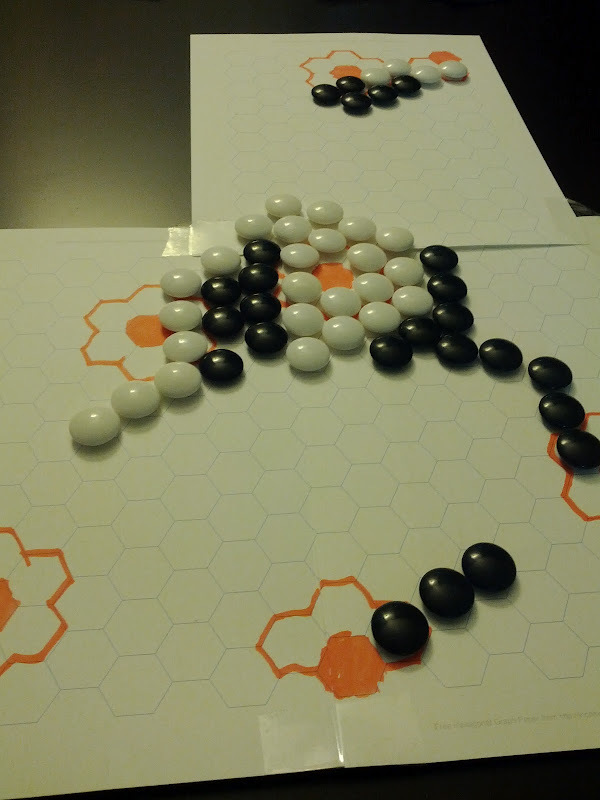 The other two testers still liked the idea of replacing an opponent's piece instead of sharing, but I no longer think it is necessary for the game. Sharing? Sharing? My head is going to explode. I was amazed myself at how well sharing worked.